A mother. A wife. A friend. A neighborly companion. Throughout her life, Dorothy fulfilled all of these roles and more. To me, she was Gramz – with a Z. My beloved grandmother. In a world that always seems to move too quickly, Gramz slowed things down. “Wait, what did Bridget say?” “What just happened?” I had to pause the movie several times to explain it to her. At the time, it annoyed me. Now I wish I could keep hitting the pause button. And then there were the times when she and I would sit for hours, often at the kitchen table, and talk about work, life, and relationships. Her presence created a safe haven for me, a space where I could laugh, vent, and cry free from judgment. The first time I remember crying in front of her was when my parents left on a trip to Nantucket. As they waved goodbye to me from the ferry, I yelled, “No, don’t go!” “Nooo!” I wasn’t ready to say goodbye. We never really are. Gramz scooped me up in her arms and lifted my veil of tears. Me with my paternal Gramz (far left) and my maternal grandma, who is 87 and another important person in my life. “We’ve got the whole week together,” she said, a big smile on her face. “We’re going to make it a fun week. We’ll go to the beach, and eat ice cream with chocolate sprinkles, and go to that playground you really like.” She came to understand my little world. Children are highly attuned to what each adult in their life can provide them, and I knew early on that my grandmother could give me stability. As a child, I found comfort in her calmness, peace in her presence. When I was 11, my mother passed away from breast cancer. As the weeks, and months, and years passed, Gramz helped raise me. She lived with me and my father a few days a week and she cooked all the meals my mom used to make. She wanted to add consistency to our uprooted routine. She stayed by my side when I struggled and never gave up hope. She listened and gave me advice that I still hold close to my heart. “You get back in this life what you give,” she’d always say. Since finding out about Gramz’s passing, I have been thinking about the intricate bond between granddaughters and grandmothers — a bond that has been a defining part of my life. When my mom died, my grandma became the hub around which the whole wheel revolved, the stitching that held together the patches of our family quilt. She was a reservoir of advice, a strong-willed woman who proved that when we lose someone we love, when we think that feeling of emptiness will never go away, someone else often steps in or enters our life to fill the void and ease the pain. 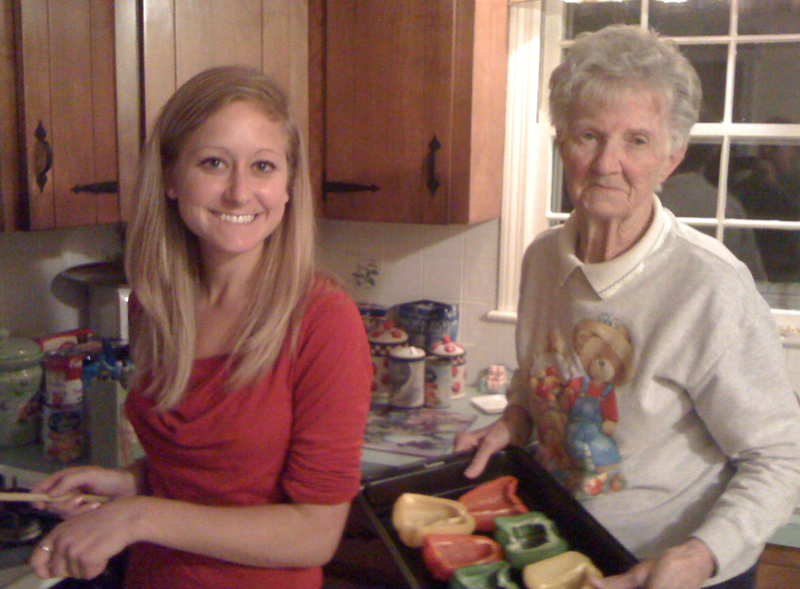 Gramz teaching me how to make her delectable stuffed peppers. My cousins and I hope to turn her recipes into a cookbook. 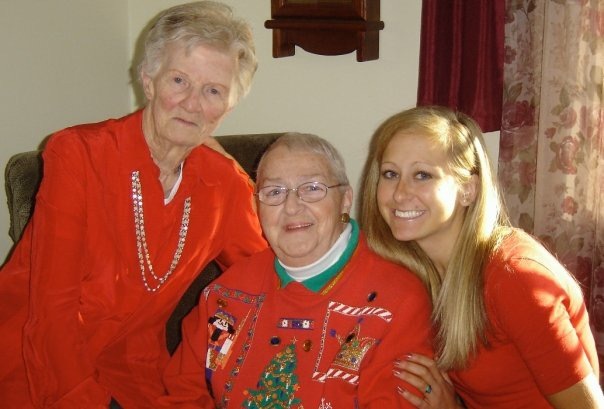 Gramz, who grew up during the Great Depression and sometimes went to bed hungry, never wanted her family to feel empty. She nourished our bellies, our minds, and our hearts – with her home-cooked meals, her wisdom, and her love. She learned how to cook from her Italian mother-in-law and came to develop the same Italian accent when describing the food she made: pasta e fagioli, pizzelles, lasagna with ricotta cheese. She couldn’t eat the majority of meals she made. She had celiac disease — meaning she couldn’t eat “wheat, rye, barley or oats,” as she’d say, in that order. Still, she made pasta and pizza and bread for her family (and would occasionally steal a tiny bite). That’s the type of person she was: selfless and hyper aware of what people needed to feel full and whole. 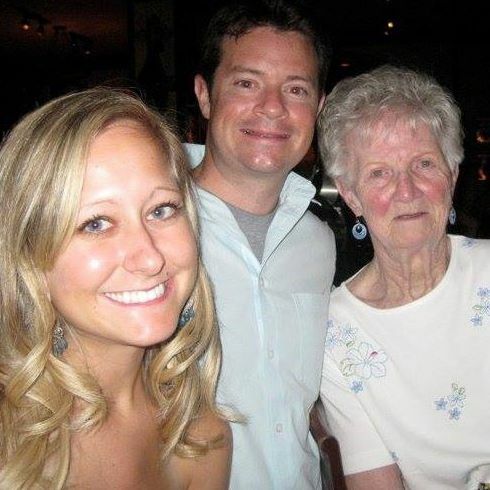 My grandmother felt whole when surrounded by family – her children, her grandchildren, her in-laws, her late husband Frank and, later in life, her partner Gordon. She continued to bless our family with her wisdom, patience, and unconditional love until her final days. As I walked through her house this past weekend, I saw dozens of family photos, envelopes stuffed with prayer cards, and pouches full of Rosary beads. My grandma went to church regularly and volunteered at the church’s thrift shop. She bought most of her wardrobe from that thrift shop and easily became the best-dressed 92-year-old in Cape Cod. When I was younger, I always hoped Gramz would live long enough to see the man I would marry. She did, and was incredibly fond of Troy. When I moved to Florida after college, she worried about me being so far away from our home in Massachusetts. Once I married Troy, it gave her peace of mind to know that I had a life-long companion. It was my grandmother’s time. Knowing her, she would want us to remember that as people are plucked from this earth, new seeds are planted, and new flowers are forever blossoming. The regenerative cycle of life helps us grow; it keeps us grounded. Gramz touched each and every one of us in this room. When I think about her impact, I think about one of her favorite movies — “It’s a Wonderful Life.” In it, an angel-in-training named Clarence gives a dispirited man named George Bailey a look at what the world would be life if he had never been born. At the movie’s end, Clarence gets his wings and George realizes his impact on this world. Our world would be much different if Dorothy hadn’t been here. She was the best gift we could have received, and having surely gone to Heaven, she will continue to bless us with her generous spirit. Knowing Gramz, she is probably already working hard as an angel in training, and is well on her way to getting her wings. It seems fitting that Gramz’s name was Dorothy, which is Greek for “a gift from God.” Dorothy was that, and so, so much more. May her beautiful soul forever live on in our hearts and minds, and may her memory nourish us all the years of our lives. 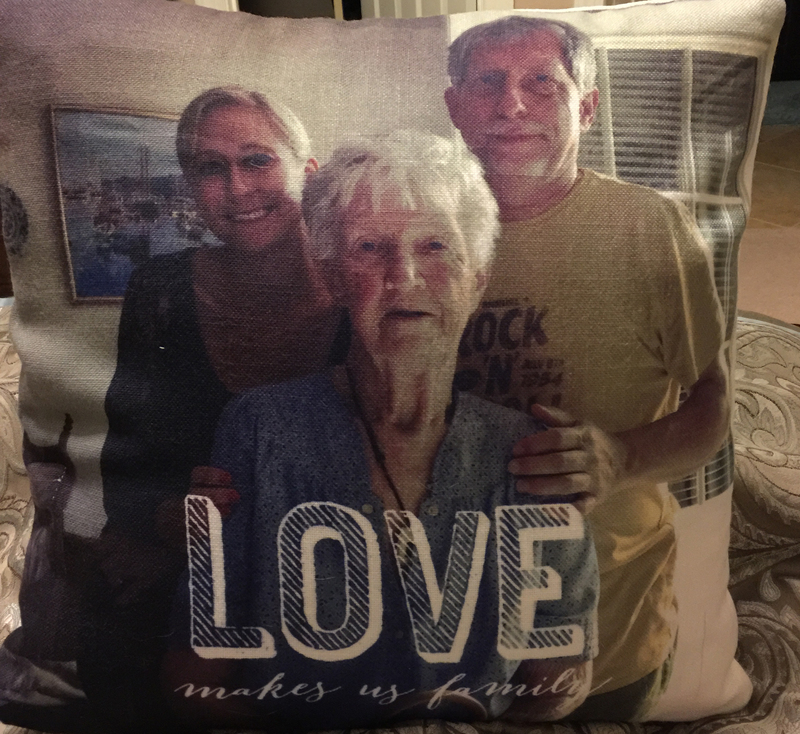 I turned this photo of me, Gramz, and my dad into a pillow and gave it to Gramz last Christmas. It was the last photo I ever took with her. She loved the pillow and took it to the rehab facility where she stayed for several months before passing away. It’s now on my bed at home. If you click on the audio clip below, you can hear a related voicemail she left me and Troy on Christmas Day. Beautiful piece, Mallary. Reading this made me feel like I was sitting in your Gramz’ kitchen, visiting the thrift shop, or watching “Bridget Jones Diary” with you. What love she gave to others, and what love you will pass on through your actions and your powerful words. Thank you for sharing this wonderful life and how yours would have been different without it.